The Ayutthaya long period is unfairly neglected by art lovers. 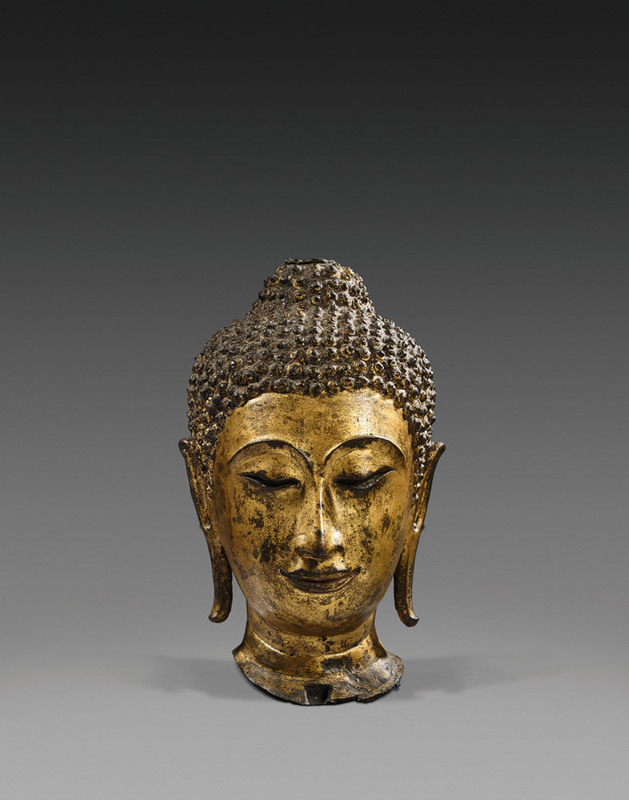 The Thai art of this period, among an imortant production of average quality, holds masterpieces like this Buddha head. The face immortalizes the Sukhothai style features of the Kamphaeng Phet workshops (Le Bonheur, 1994, p.111 ; p.146, pl.76 and p.487, fig. 380). Thus, the brow lines, in perfect semi-circles, extend to the nose bridge. Hair is handled by small juxtaposed ringlets. A flame, now disappeared, graced the usnisa on the top of the head. Beauty folds on the nek are perfectly represented. However, we note many changes, compared with purely Sukothai pieces. The face is thinner and less elongated; the nose is less aquiline; the lips are less plump. The mouth corners squeeze out a smile light and inscrutable at the same time. All these details confer on the head an extremely ornemental appearance, which is enhanced by a beautiful gilt applied to a bottom of red lacquer. Also the eyes, formerly inlaid with mother-of-pearl and gemstone, gave to the Buddha a hypnotic presence in the dim light of a sanctuary. Besides the head of the colossal Buddha, preserved at the Chao Sa Phraya national museum, we can compare our commented Buddha head to the head of a standing Buddha preserved at the Hermitage museum (Inv. N°159. Siamese art ...1997, p.128, n°53) and a head from the Walters Art Gallery of Baltimore (Inv. 54.28.25, Woodwards, 1997, p.238, 258, n°99). Le Bonheur, Albert (dir. ), L'Art de l'Asie du Sud-Est, Paris: Citadelles et Mazenot, 1994. Siamese art of the 14th-19th centuyries in the Hermitage, Saint-Petersbourg: Slavija-Intterbuk, 1997. Woodward, Hiram W., The Sacred Sculpture of Thailand. The Alexander B. Griswold Collection. The Walters Art Gallery. Bangkok: River Book.